At HPI Building and Renovations, we handle just about every type of home remodeling and renovation job under the sun. But among all the possible jobs we do, bathroom remodels are among the most popular request. 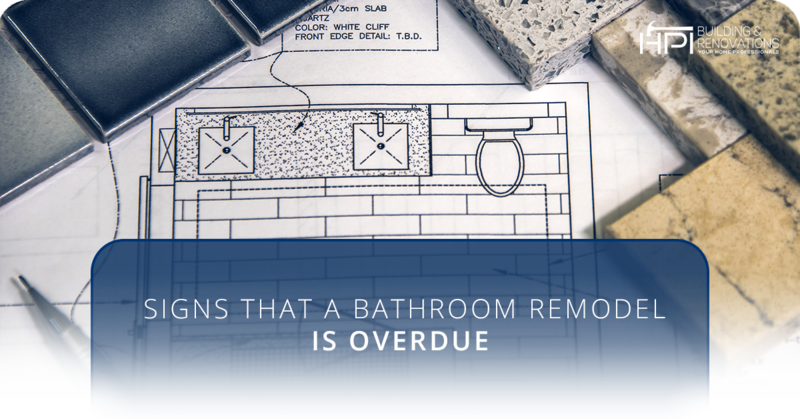 The reason for this is simple — bathrooms are one area of the home that could benefit the most from a remodel. Unfortunately, it takes many homeowners far too long to understand that they’re way overdue for a renovation. Mold and Mildew: Mold and mildew can build up in your bathroom due to its moisture-heavy nature. This can spread, cause foul odors, and decrease the air quality of your home. Cracks: If there’s one space in your home that you want airtight, it’s your bathroom. Cracks in the shower or bath will invariably cause leaks and water damage, and we don’t need to explain why you don’t want your toilet water anywhere except for the toilet. Plumbing: The bathroom isn’t something we’d call “nonessential.” If you find yourself unable to use your toilet or shower because of the plumbing, it’s time to get it repaired. While you can opt to simply repair these issues, it’s often better to just spring for a full remodel, since you’ll already be calling a professional anyway. Most homes see renovations in almost every other area before the bathroom gets a big update. People rearrange and renovate their living rooms and kitchens very frequently, since so much time is spent there. Plenty of time is spent in the bathroom, but since it’s not a “public” part of the home, it often gets left behind. This, of course, results in many bathrooms that are grossly incongruent from the rest of the home. If you’re rockin’ a 60’s wallpaper that’s chipping away with yellowing porcelain toilets and sinks that have forgotten their once-white sheen, you’re in prime shape for a bathroom remodel. Some bathrooms, for lack of better words, have abysmal design. Bathrooms often cram a lot of junk into a tiny space, and sometimes it’s not ideal. Some bathrooms have enormous vanities that are disproportional to the number of people who would realistically be using it. Other bathrooms cram a bathtub into a crowded space with the toilet awkwardly sitting next to it. At this point, you probably know what aspects of your bathroom you do and don’t use. If the vanity is too big, a remodel can trim it down. If you’ve never once taken a bath, why not remodel it into a shower and free up some space? The sky is the limit! Fortunately, if you’re in the market for a bathroom remodel in or around Arnold, Maryland, we know exactly who to call — HPI Building and Renovations! We are highly experienced in carrying out renovations, and we make it our top priority to work closely with our clients to deliver a result that exactly matches their dream layouts. Contact us today for home remodeling services, and many other jobs!